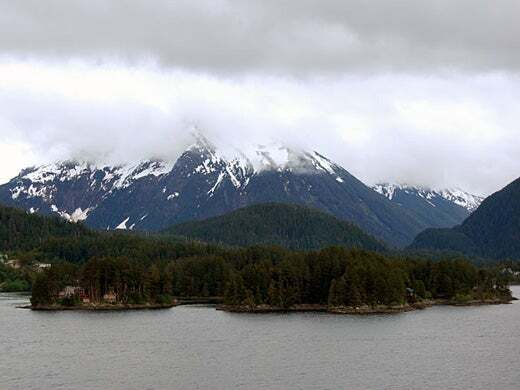 After an all-night run down from Hubbard Glacier, the MS Oosterdam arrived in Sitka for the latest stop in the MacMania VI cruise. 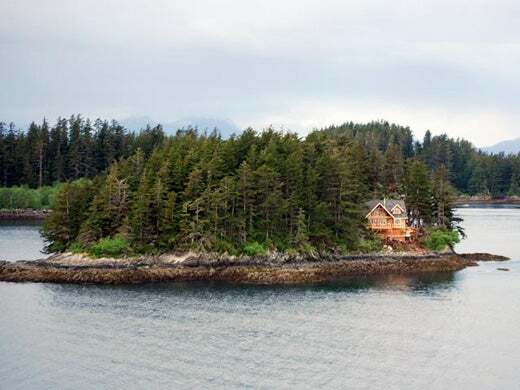 Like Juneau, Sitka is only accessible via boat or air, and has only around 9,000 year-round residents (which makes it Alaska’s fourth- or fifth-largest city, depending on who’s doing the counting). With only 40 total miles of roadway (just over half of it paved), car theft isn’t much of an issue around here, unless there’s a ferry at the docks. Of course, private is a relative term—today there were two cruise ships parked within a few hundred yards of the home’s front door! It may not look like it, but these are relatively large boats. 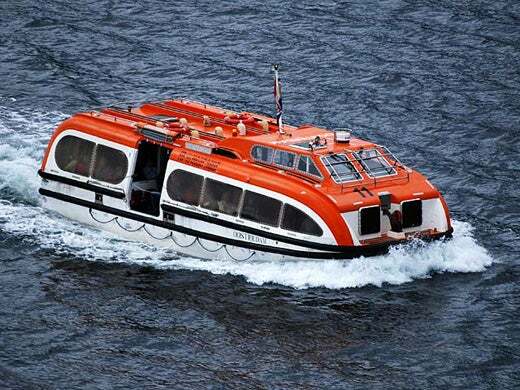 When used as tenders, they carry 120 people at a time to and from the shore. (In lifeboat mode, an additional 30 people can be seated.) Having now ridden on one a few times, I’m reassured that they seem to float quite well even when heavily loaded, but they cannot really be described as comfortable. For today’s shore excursion, I chose to try a “dry suit snorkel” experience. I figured I’d be the only one, given the 7:45 a.m.-departure hour and the 54°F water temperatures. Amazingly, though, eight others had similar thoughts, so we had a full van load to the dive shop. For those who don't know, a dry suit is a dive suit that keeps you dry when diving or snorkeling. Wet suits, which are what most divers and snorkelers use, keep you warm by allowing a thin layer of water into the suit, where it quickly warms against your body and then stays in place (hopefully!). The initial warming period, however, can be quite shocking (speaking from experience, as one who took their scuba certification dive in a wet suit in 50°F waters). A dry suit, on the other hand, includes very tight rubber collars around the neck and wrists, as well as boots that are integrated directly into the suit. If everything is working properly, no water enters the suit at all. But as our instructor said, “If it doesn’t feel like you can’t breathe, then your suit is probably too big.” Once you adjust the neck collar’s position, though, breathing returns (mostly) to normal. Since the water is kept out of the suit, you can wear typical street clothes underneath it—most of us were wearing sweat pants and a sweat shirt, and the shop offered fleece pull-overs for those who wanted them. You then put a neoprene hood over your head, neoprene gloves on your hands, add the mask, snorkel, and fins, and you’re ready to go. As your head and hands are only covered with neoprene (wet suit material), you’ll get to feel the actual water temperature for a few minutes in these areas. And yes, it was cold. But once the layer of water warmed up (or your head and hands went numb), all was fine. The snorkeling was OK, but nothing compared to the diving on last fall’s MacMania cruise. We saw lots of star fish, some very young salmon, and a few needle fish. After about 45 minutes in the water, we climbed out, removed the dry suits (back in the shop, of course), and were happy to discover they worked as advertised—our street clothes were completely dry. After walking around town for a bit, I returned to the ship to relax for a while and get ready for the evening’s Introduction to Automator class, which I’m taking as a student. Automator is one of my favorite OS X 10.4 features, and I’m hoping to learn more about it from Apple’s own Sal Soghoian, the AppleScript Product Manager. That’s one of the great things about these Geek Cruises: the ability to get instruction from the people who know these products inside and out. Many of the Aperture courses, for instance, are being taught by Joe Schorr, who is Apple’s Aperture Product Manager. It’s hard to find courses outside of the Geek Cruises where you’ll find Sal and Joe teaching small classes in a very hands-on learning environment. While classes are going on tonight, we’ll be headed towards Ketchikan. After Ketchikan comes a 16-hour run down to Victoria, British Columbia, then back into Seattle.